Silvia Saunders was the daughter of professor A.P. Saunders. A.P. 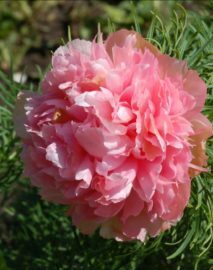 Saunders was arguably the most influential peony hybridizer of the 20th century, his daughter took over his nursery to distribute his plants after his death. She regularly wrote articles in the American Peony Society Bulletin, this is one of those articles wherein she describes what more could be done from future hybridizers. Many of the points she made in 1970 are still valid today. 1. Blooming season of the peony to be lengthened. It’s only about six weeks’ duration now. At both ends: earlier into the spring, and later into the summer. 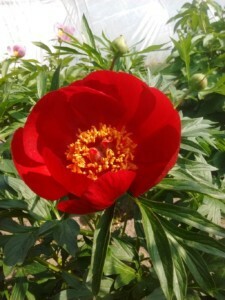 Is there any good and valid reason why the peony could not bloom all summer long. like the roses of England? 4. Foliage more varied. Present peony foliage is remarkably monotonous und “Same.” Species with unique and lovely foliages that could be used: Mloko (jade gray- green, and lovely matte surface; purple stems); Daurica (triternata) with its riffled edges;- Emodi, with fern-like leaves; Tenuifolia with its asparagus-like leaves. And the Tree Peonies with the most elegant foliage of them all. We’ve never bred for foliage, have we. Always for flowers. 5. 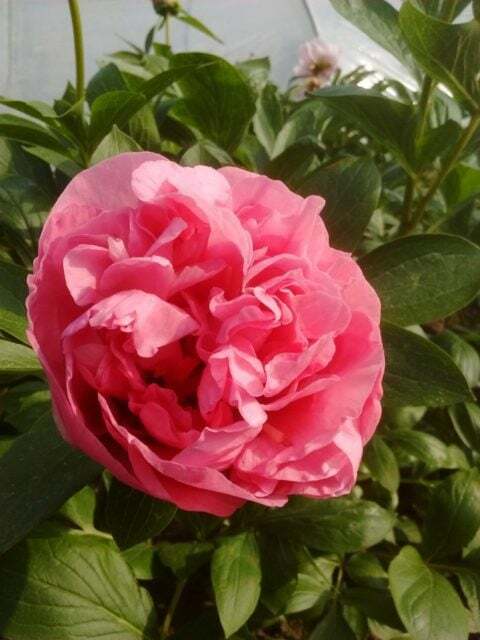 Quality of petals of the herbaceous improved till more shimmeringly silky, like the tree peonies. Even the lutea hybrids haven’t this shimmering quality. 6. Height of peonies to be more varied: more very tall kinds, trained up a post, as in Italy; more very dwarf kinds for the modern small garden. 7. Fragrance should be greatly improved. The yellow species P. lutea is the only peony that smells really delicious; rather like a waterlily. 8. Disease-resistance should of course be worked for, during all these other programs. 9. Climatic Range should be extended: into the South; the moist; the shade, etc. 10. Soils. 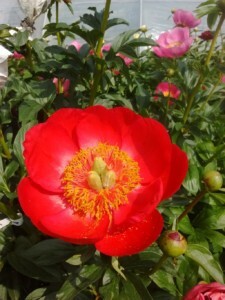 Peonies should be made to accept a wider variety of soils: more acid, more sandy, etc. 11. Seeds should be made to geminate always the first Spring. 12. What about the stoloniferous habit of P. tenuifolia and P. lutea? Could this be made into anything useful? There, we’ve set down not ten but twelve ways, any one of which would definitely improve our peonies. So, now that we see where some of our directions lie, nothing remains but for Man, that is Us, you and me, to roll up our sleeves and get to work. The time is Now. You and I have to start hybridizing, for that is the way most of it is to he accomplished. And we who work in peonies have one great advantage over our friends in iris or “hems.” There are so many of them, and they’ve introduced so many thousand new varieties of those plants, that your chances of coming up with something really new and worth introducing are not much better than about -one in ten thousand. Whereas in the peony, so little has yet been done that all of us have a good chance—say one in a hundred—of bringing forth a new kind that will really be an advance on the old. 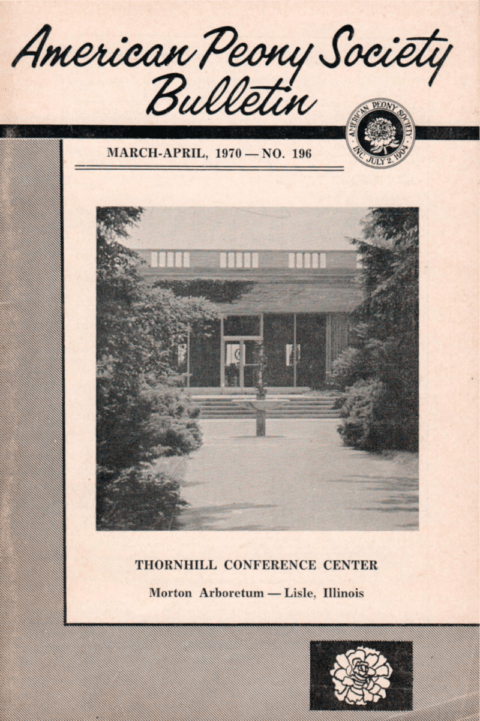 Even if you are not in the Peony Society you may still write -either to me, or far better to E. L. “Roy” Pehrson, whose address you’ll find at the end of this article. Either of us will tell you how best to lay out ten dollars this fall on peonies that will be useful in hybridizing. You’ll probably have to buy one or two fertile lactifloras, an F-2 or an F-3 herbaceous hybrid or two, possibly a species, if you wish, and perhaps one or two lutea (tree peony) hybrids. These should start anybody on the right road. The December 1968 Peony Bulletin (one dollar. Address at end of article) gives full and simple directions, in case you’ve never done it. I see it all just ahead. We have splendid men now working, either actually on the breeding, or in exploring new paths such as chromosome counting, that may lead us into hitherto unknown terrains. Daphnis, Fiala, Pehrson, Reath, Wissing, to mention only five, and these only in America. We don’t even know what the Japanese are doing at the moment; I’d look for closer ties with them. We have the work of the past hybridists to build on, so we needn‘t try to excuse ourselves simply because we are 60 years old or more; just take up where our predecessors left off. Research would almost certainly reveal that all the great breeders did most of their important work after sixty. And all that is spadework now over and done with. We can start in right there. 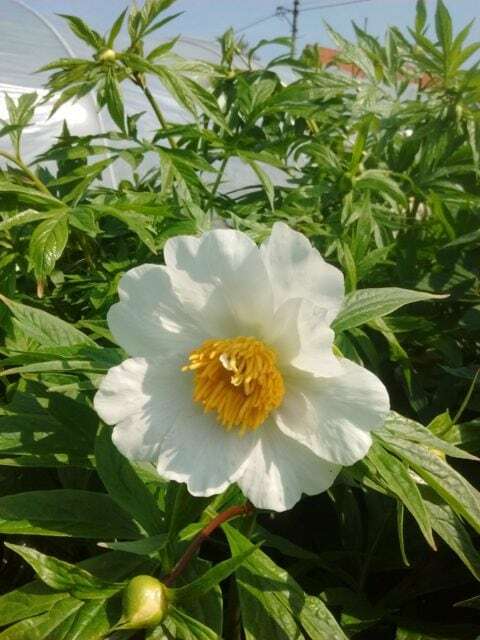 We know now that yellow lutea hybrids can be crossed onto lactiﬂora, so we don’t need to put ourselves through that back-breaking, eye-blinding chore of counting chromosomes of hundreds of tree peonies; it’s been done. Our present men are telling us every day which lacti‘s have viable pollen, and which set seed, so we don’t need to spend precious time on the useless ones. The Explorers are just as valuable in their laboratories as the Hybridists out in the sun. Will our Chromosome-counters tell us, please, just exactly what it is, in the rose, that enables one plant to bloom for two months or longer? What exactly is it that causes Dwarfness, or tall- ness?What is it that makes some seeds need their warm period ahead of their cold (dormant) period? So please don’t ever let me hear again: “Oh if only I were younger! Here I am over sixty!” Nonsense. You’ll be one of our most Useful People. Write letters. Help in planning a Show. There’ll be many ways of having a part in this great new Movement. Let us all get to work in some way or other, on the Peony. Who knows? 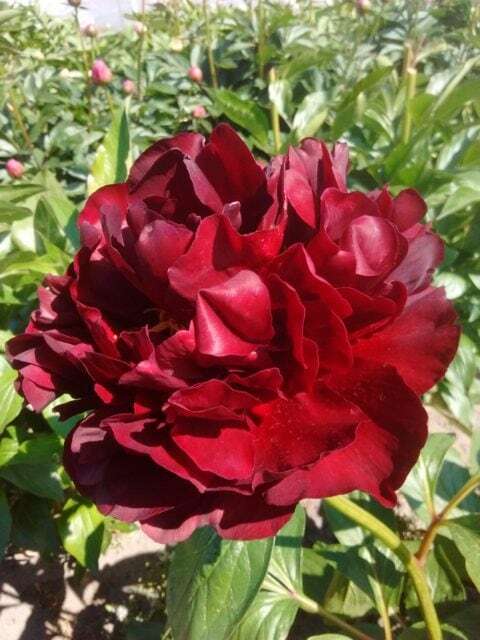 In twenty-five years—that’s only the twinkling of an eye, horti-culturally speaking—we may completely transform the Peony into the Plant it Should Be. Is it a step towards black or blue? What's that different peony over there? A rare Coral Charm seedling. The Peony Society 1 year, 7 months ago. If you’d like to comment on this article, please do so below.